Will the new iteration of Facebook be as good as the iPhone? The Facebook app for Android is finally getting a facelift to include the Places functionality seen on its iPhone counterpart, while also adding Groups. Android owners will now be able to check-in at their current location on Facebook using their handset's GPS signal using Places. This will allow those using Android to capitalise on the new Places Deals service announced at Facebook's mobile event this evening. The refreshed app is a welcome boost for Android users who've long bemoaned how poor the Facebook portal is compared to the iPhone iteration. 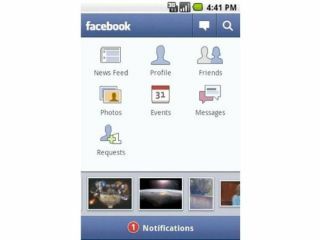 "Traditionally the Android app has always been a little bit behind," said Mark Zuckerberg. "We didn't have a full team working on it, but now we're back on track." The iPhone app itself also got a lick of paint, with users now able to geo-tag photos using Places, while both platforms will be able to access their Facebook Groups from within the app. The new apps will be available to download from their respective stores shortly.